You have limited time to guide GERALD (Gyroscopic Environmental Reconnaissance And Land-Mapping Device) through an abstract terrain. Navigate narrow catwalks, steep slopes icy patches and trampolines to explore the alien world and collect the time-jewels. Don’t fall off. This version currently features about a third of the full world of Spindizzy - the south "wing" of the full map is complete. It’s also missing a few key bits of functionality such as switches and the map. These will be coming soon, along with the addition of sound effects. I'm not sure if I'm going to bother adding more rooms, we'll see. This was originally my entry for the Retro Remakes Jam, 20th July 2017. The submission only had 12 rooms and had limited accuracy and features. The current version expands this to around 70 rooms, and features improved physics including trampolines and ice. Spindizzy was originally released in 1986, by Paul Shirley for Electric Dreams Software. This is a (fairly) faithful recreation of a portion of Spindizzy, with graphics modeled closely on the ZX Spectrum version. I make no claim to the rights to reproduce the original work. This was made for fun and as a tribute to one of the great games of my childhood. I don't charge for this game on that basis, though any tips (financial or otherwise) are always welcome. Quit living in the past! :D - No worries, will add tonight. Hi. 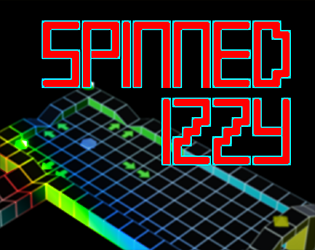 I've uploaded the 32bit build of Spinned Izzy now. I'll look into that some time but it's not a priority for now, sorry.